Few peer reviewed papers have been published in science journals discussing the links between wildfires and climate change. The IPCC's latest report (the AR4) discusses the likelihood of increased wildfires, making the causal link to the increase in drought conditions. California has indeed been in a recent drought, which seems to suit the effect for wildfire causality. Of the few reports published on this subject to bind cause and effect, researchers from Scripps and the U.S. Geological Survey in La Jolla compiled their findings in a report published in the journal Science back in 2006 (which you can find here). Taking into account this limited information, there would be no doubt we're seeing the signs of climate change in the form of fire across the West. But, as is so often the case in climate science, the devil's in the details, and not all is as it seems. The Scripps study does use a variety of scientific analyses to prove its point: that climate change is responsible for an increase in wildfire intensity in recent times. This study though only covers a brief period from 1970 to 2006 -- a mere grain of sand in the hourglass of geologic time. If we take a look at a longer span of time, adding just a few decades to the formula, the results become diluted. Although all fires that burned in California in 2007 consumed a little over 1 million acres, this pales in comparison to the single Peshtigo fire in 1871 in Wisconsin that burned nearly 4 million acres, or the Great Idaho fire of 1910 that burned 3 million acres. The Scripps report does mention the devastating 1988 Yellowstone fire that burned 1.5 million acres, but this is also smaller than the 1898 fires of South Carolina that burned 3 million acres*&* . 1987 (Klamath and Stanislaus forest fires, 640,000 acres). It needs to be noted though that recent years (1999 - 2006) have burned more acres than in the past. For instance, in 2003, California had more than just one "significant" fire, with numerous fires burning over 500,000 acres. Nationwide, 2003 saw nearly 4 million acres burned, and 2006 nearly 10 million acres burned. But, the number of significant fire years has not increased, and recent years have had far fewer wildfires than in the 1970s. For instance, 1976 had 241,669 wildfires nationwide while 2006 had less than half that amount. In fact, since 1983, the number of wildfires in the U.S. has been less than 100,000 annually, yet from 1962 to 1982, each year saw well over 100,000 fires. * This is also mentioned in the Scripps report where the authors noted a marked increase in wildfire activity in the mid-1980s; yet these researches ostensibly overlook the fact that the 1990s were far less veracious, and much milder than the 1970s and 1960s. Additionally, California has been moving out of a drought since late 2007, and was only in a D1-D2 status (moderate to severe drought) as of January 1, 2008. * And ironically, much of the southeastern U.S. has been in a D3-D4 status (extreme to exceptional drought). * At first glance, this may seem to further support the idea of the drought-fire-climate-change connection -- droughts are popping up everywhere. But it's important to remember that climate change predictions call for wet regions to get wetter, and dry regions to get drier. The West's dry-spell would be typical for climate change induced drought due to its inherent aridity. But the southeast, an area known for year-round precipitation, should become rather wet (not dry) in a warming world. Having droughts in both the Southeast and the West, doesn't jive with climate change forecasts. In the United States, few places know as much fire today as they did a century ago. Fires have fled from regions like the Northeast that formerly relied on them for farming and grazing. They have receded from the Great Plains, once near-annual seas of flame, ebbing and flowing with seasonal tides. They burn in the South at only a fraction of their former grandeur. They have faded from the mountains and mesas, valleys and basins of the West. In fact, in his book, Tending Fire: Coping with America's Wildland Fires, Dr. Pyne points out that the U.S. has gone from a fire-flushed country to a fire-starved one, due in large part that in recent times, we've prohibited forests from performing their natural burning, thereby increasing fuel availability for fires when they do occur. In a similar vein, ever increasing human encroachment into the wilds of America has put more homes at risk, thus making fire events in recent times more devastating in the loss of property and human lives. When wildfires do burn though, they release the infamous greenhouse gas CO2, but not to the extent that the media may have you believe. This often misunderstood fact has been conflated with the imprecise use of wildfire statistics, publicized in numerous headlines late last year including Reuters' California wildfires unleash climate-warming carbon, and other such alarming stories describing how millions of tons of carbon were released into the atmosphere from California's wildfires. While it is true that wildfires release carbon dioxide into the atmosphere, the media didn't do a good job at stating the fact that even when you include all wildfires in the entire contiguous 48 states, they only release about 4-6% of all human-induced greenhouse gas emissions. * California's 2007 wildfire was just one of many fires over the years, and added an even smaller percentage to the anthropogenic totals. While either being overlooked intentionally or otherwise by the media, the simple fact about the diminutive addition to the carbon cycle from the California fires didn't stop the Huffington Post from publishing their gloom and doom story (which you can find here), that, without knowing the facts, could make one believe the world is becoming ablaze and global warming's to blame. If though the media were to tell the whole story, it would be rather boring, so a little hype in the headlines with one-sided storytelling helps their ratings -- it's the nature of their business. Earth's climate is changing and there exists a scientific link between a warming world, droughts, and subsequent wildfires. But fear has recently outpaced science and awareness. Politicians paranoid over our planet's plight, and journalists vying for the highest ratings on the story du jour, tend to treat every weather and climate event as though it were anomalous and inextricably linked to the loathsome hand of man. Wildfires have befallen that same fate, now used as pawns in the games of politics, policy-making, and periodical publication. But now that rain is upon us, and much of the West moves out of a drought, don't be surprised to read headlines on how flooding rains and subsequent mudslides are also caused by global warming. To stay abreast on similar articles like this, you can signup for the free GreenhouseTruth newsletter. 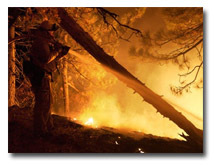 Additional information on climate change events, wildfires, IPCC reports, and other topics discussed in this blog can be found in Nathan Cool's new book, Is it Hot in Here?--The simple truth about global warming. Click here to get your copy.